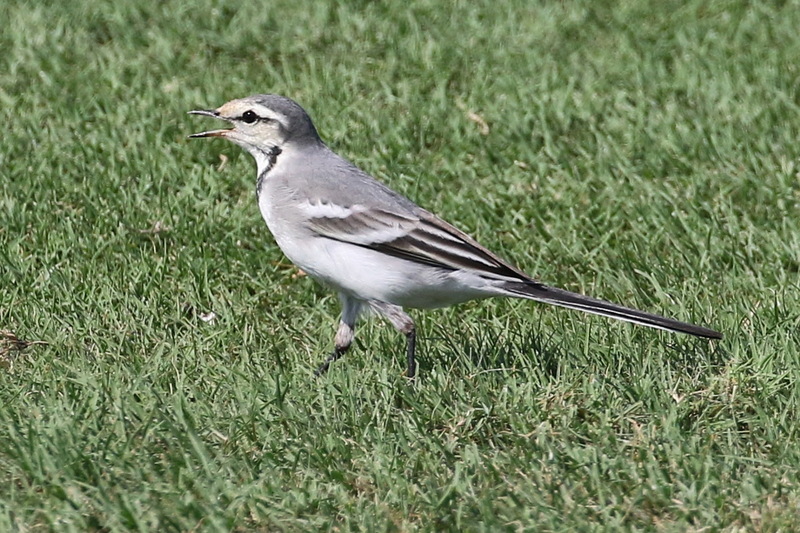 While on a work-related trip to Abu Dhabi in November last year, I came across an interesting alba wagtail in a loose mixed flock of alba, flava and citreola wagtails. The site was an operational golf course, and the short grass, sand bunkers and water features obviously presented feeding opportunities for these birds, as well as many other species in the surrounding few hectares of green space. My encounter with the bird in question lasted for around four-five minutes, with initial views being good at roughly 4 m.
A few record shots were taken from 6-7 m away, but as the distance between myself and the bird increased so did the lure of other species present (among which were Hoopoe Lark, Asian Desert Warbler, Daurian Shrike and Desert and Isabelline Wheatears). Such species are obviously of real interest from a British perspective and my attention was somewhat collared. Though intrigued by the wagtail, I made the choice to study the photos later. It was then that I realised the bird was a putative Motacilla alba ocularis – an 'East Siberian Wagtail'. 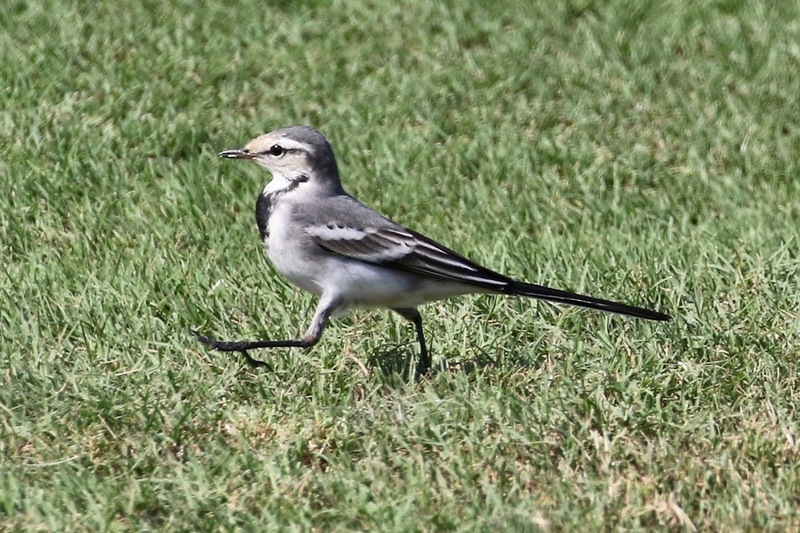 Presumed ocularis White Wagtail in Abu Dhabi (Jamie Partridge). In the field, the face pattern had an even black eye-stripe, a bold white supercillium and broad white fringes on the median coverts. The first two features were obviously quite arresting and the last seemed unusual and slightly at odds with the other surrounding albas. It was clear that I was looking at an alba wagtail of some sort. The mantle tone was perhaps slightly darker than the other albas present, but strong sunlight and shadow had made judging mantle tones of gulls during the trip surprisingly trickier than I had expected, and that could have also been the case for this bird. The grey tone was consistent from the crown to the rump. The bird showed completely clean white flanks, the median and greater coverts had broad bright white tips and dark centres. The greater coverts were diagnosed as first generation, and this feature and the grey forehead, crown and nape are indicators for ageing the bird, which I considered to be a first winter. Consultation with Krister Mild (co-author with Per Alström of Pipits and Wagtails of Europe, Asia and North America) confirmed both median and greater coverts as un-moulted juvenile feathers which, due to its north-easterly breeding distribution, is a pro-ocularis feature. Only M a ocularis and M a lugens show an eye-stripe, but I eliminated lugens fairly easily by noting the lack of any second-generation black feathering in the mantle and rump, and also the dark centres to the wing coverts, which are largely white even in first-year lugens. The eye-stripe itself was narrow and evenly wide, again supporting the identification as ocularis. Next came the potentially problematic task of eliminating an intergrade with dukhunensis or baikalensis, two other Asian taxa: the wing-covert pattern in first-year birds seems to overlap greatly with those, and so is perhaps not so much use. However, ocularis tends towards broader, brighter white fringes to its median coverts, as seen on the Abu Dhabi bird. The greater coverts might show a less-than-average amount of white, but I have found identical covert patterns from photographs of birds within its core range. The strongest feature and most indicative of subspecies is the eye-stripe, which is clear, well defined and unbroken. The bird behaved and sounded like alba as it fed and moved, giving the occasional tzitzik-type call. Though only seen for about five minutes, the putative ocularis wagtail enabled good and potentially diagnostic record shots to be taken (Jamie Partridge). In the Palearctic, ocularis breeds in north-central and eastern Siberia, west to the west-central Taimyr peninsula and (locally) to the Yenisey river south to around 60° north, and east to the Chukotka and Kamchatka peninsulas south to about 57° north. It winters mainly on the Asian mainland, east to southern China, southward to Indochina, Thailand and Malaysia, and west through Myanmar and north-east India as far west as Rajasthan. Krister Mild said: “The bird is a first-calender-year ocularis. The only theoretical confusion subspecies is a first-winter female lugens, but this usually shows a large white wing-panel ([composed of] more or less all-white median and greater coverts), blackish uppertail coverts and [part of the] rump, and sometimes some blackish or dark greyish lesser coverts, too. In lugens, the black eye-stripe is generally slightly broader and less evenly wide. “This bird displays all the typical characters of a first-winter ocularis, including a narrow and evenly wide eye-stripe and distinctly dark-centred median and greater coverts. I can’t make out the colour of the uppertail coverts and rump of the bird in the photos, but as long as the field-notes say pale grey rump and uppertail coverts, much as in the accompanying alba, everything is fine. “You describe a moult contrast between the ‘adult median coverts and the retained juvenile coverts’. I assume that you regard the median coverts to be of adult type and the greater coverts of juvenile type. In my view all greater and median coverts are of the same age, hence I cannot see any moult contrast. Most first-winter ocularis have retained juvenile median and greater coverts, and those that renew some feathers generally have a moult contrast within the greater coverts between new-all white feathers and retained dark-centred ones. There is some variation in first-year birds regarding the darkness of the centres and the width of the white tips of the median and greater coverts (first-year males show more white on average, but there is much overlap). This bird has slightly wider white tips to median coverts and possibly slightly less dark centres to the greater coverts than in typical first-winters. Nils Van Duivendijk offered an opinion that: “This indeed looks like a very proper ocularis! I agree with the age as first winter (moult contrast in greater coverts, with the median coverts being new adult-type [feathers]), but are you sure it's a female? [The] large white forehead and ear coverts look more male-like to me, but maybe this is just the effect of the ongoing post-juv moult? Magnus Hellström also agreed with the age as first winter, and said the bird “appears as a good ocularis”.